Good color, nice clarity Smoky Quartz Crystal hearts with lots of inclusions that reflect amazing rainbow lights. Smoky Quartz has a gentle yet intense clearing quality that dissolves habitual negative thoughts and feelings which poisons daily life by prolonging resentments. 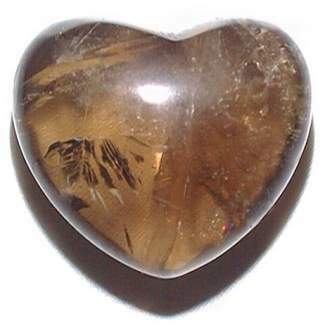 Beautifully polished 45mm or 1 3/4" puffy heart shaped gem stone with its own velvet pouch.